Eternal sunshine of the spotless cycle? 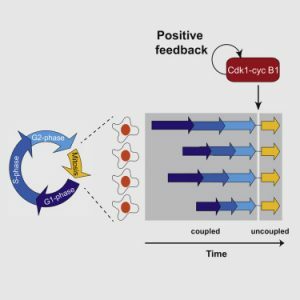 In a recent study, Purvis and colleagues (Chao et al, 2019) quantify cell cycle phase durations in human cells and propose a model whereby cell cycle progression in single cells is a succession of uncoupled, memoryless phases, each composed of a characteristic rate and number of steps. They also suggest that having such memoryless phases is a feature of healthy cells, while cancer cells have correlated phases. Silvia Santos (Crick, London) and Lendert have written a News&Views piece about this article. 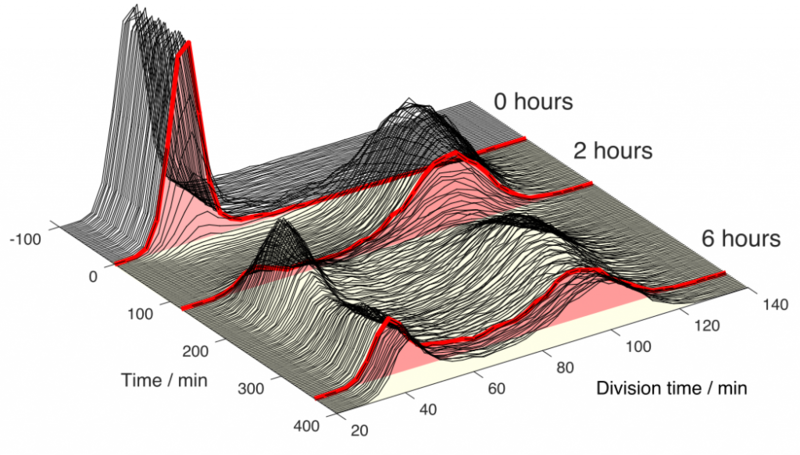 Do biological timers and sensors work together to coordinate processes in cell signaling? In a perspective piece in BioEssays, Junbin Qian, Mathieu Bollen, and Lendert argue that this is indeed the case. Recent data suggest that timers and sensors can work together to guarantee correct timing and responsiveness. By exploring examples of cellular stress signaling from mitosis, DNA damage, and hypoxia, we discuss the common architecture of timer‐sensor integration, and how its added features contribute to the generation of desired signaling profiles when dealing with stresses of variable duration and strength. In a joint effort with Tobias Hansson, Stefan Wabnitz, and François Leo, Pedro investigated theoretically the dynamics of quadratic frequency combs in a dispersive second-harmonic generation cavity system. We identified different dynamical regimes and demonstrated that the same system can exhibit both bright and dark localized cavity solitons in the absence of a temporal walk-off. These results are published in two Optics Letters papers, see here and here. In a collaboration with the lab of Jeroen Raes (KUL) and Luc De Vuyst (VUB), Stefan has helped exploring human gut community dynamics. We established a synthetic community composed of three representative human gut isolates (Roseburia intestinalis L1-82, Faecalibacterium prausnitzii A2-165 and Blautia hydrogenotrophica S5a33) and explored their interactions under well-controlled conditions in vitro. Using a mechanistic model as reference, we demonstrated that strains grown in co-culture behaved differently than those in mono-culture and confirmed their altered behavior at the transcriptional level. For more information, see the publication in eLife. We’re happy to welcome Arno to our lab! 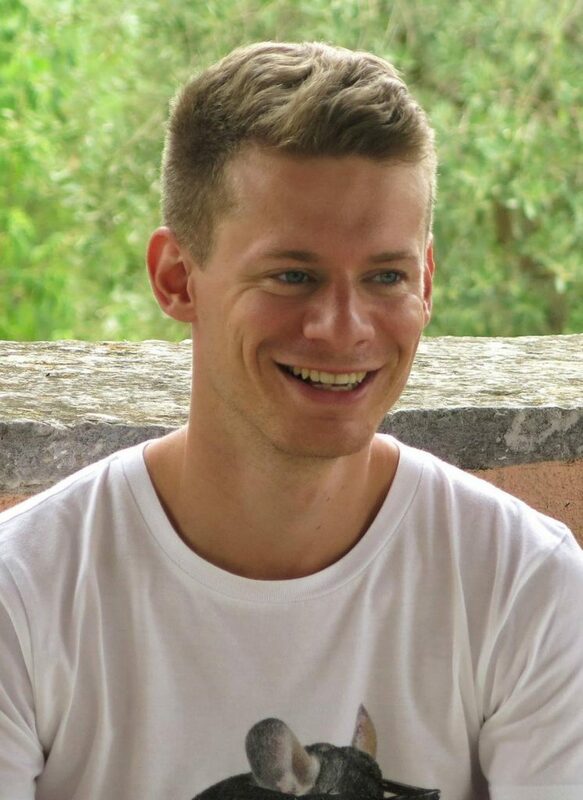 Arno studied biosystems engineering and he will be designing and using microfluidic devices to study various aspects of the spatiotemporal regulation of the cell cycle. Toxin-antitoxin (TA) systems in bacteria and archaea are small genetic elements consisting of the genes coding for an intracellular toxin and an antitoxin that can neutralize this toxin. In various cases, the toxins cleave the mRNA. 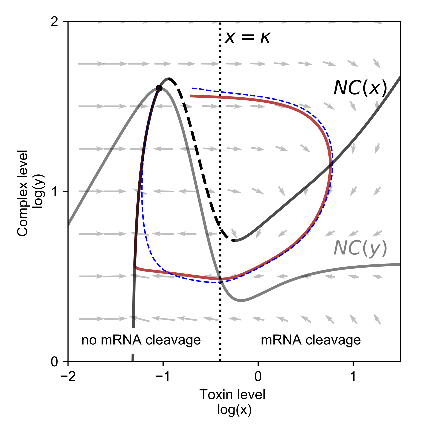 Stefan and Alexandra have used deterministic and stochastic modeling to explain how toxin-induced cleavage of mRNA in TA systems can lead to excitability, allowing large transient spikes in toxin levels to be triggered. This work has been published in PLoS One . 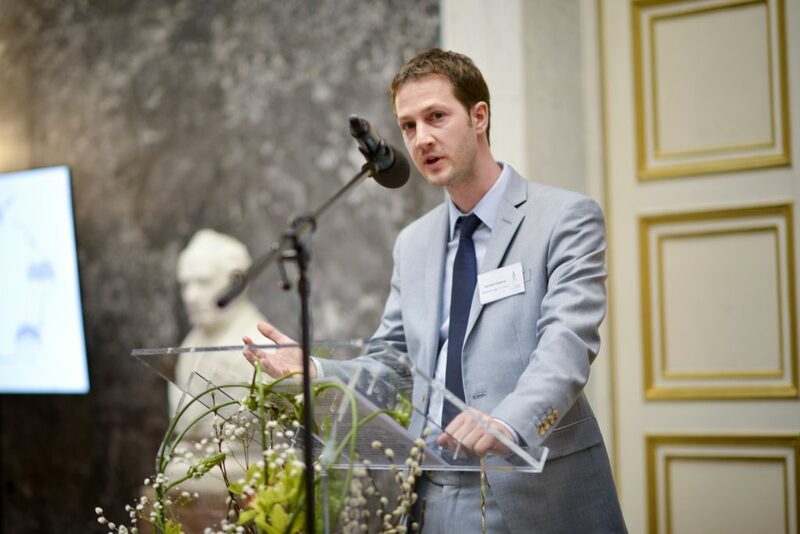 In the context of Stefan’s joint PhD at the ULB (with D. Gonze) and VUB (with J. Danckaert) in Brussels, he has theoretically studied the dynamics of two interacting microbial species in the chemostat. These species are competitors for a common resource, as well as mutualists due to cross-feeding. He demonstrated that this system has a rich repertoire of dynamical behavior, including bistability, and showed that the different steady state solutions can be well captured by an extended Lotka-Volterra model. This work was published in PLoS One. Pedro has studied the origin, stability, and bifurcation structure of different types of bright localized structures described by the Lugiato-Lefever equation. 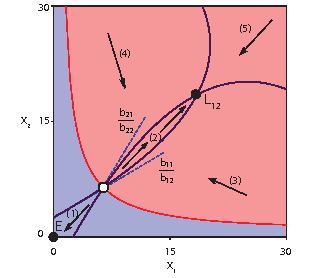 This mean field model describes the nonlinear dynamics of light circulating in fiber cavities and microresonators. In this work, published in Phys. Rev. 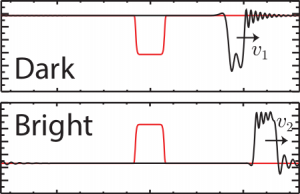 E , we show how the organization (bifurcation structure) of these localized light patterns critically changes as one increases the cavity detuning, one of the important experimental control parameters in the system. Adrian Saurin (Dundee Univ.) 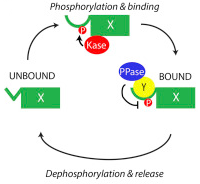 and Lendert have written a commentary on the potential roles of dynamic phosphorylation-dephosphorylation cycles. They discuss how rapid cycles could underlie important signaling properties, including the ability to rapidly bind and release proteins. Jan’s work on delay models for the early embryonic cell cycle oscillator has been published in PLoS One . We showed that different implementations of the time delay can have a large impact on the resulting oscillation, exploring a fixed time delay, a distribution of time delays, and a delay that is state-dependent. Well done Jan and Alexandra! 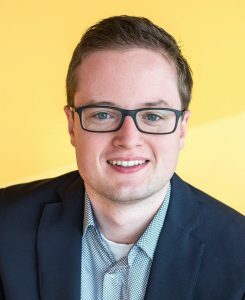 Lendert has been elected member of the Young Academy, part of the Royal Flemish Academy of Belgium for Science and the Arts (KVAB). On February 6, the Young Academy celebrated their five year anniversary and twelve new members were inaugurated with speeches by Prof. Robbert Dijkgraaf and the King of Belgium (http://jongeacademie.be/5-jaar-jonge-academie/). The Young Academy is an interuniversity and interdisciplinary meeting place for scientists and artists to work on initiatives related to e.g. science communication, policy, and education. In a collaboration with Nela Nikolic from Isabella Moll’s lab at the University of Vienna, we have studied how growth heterogeneity in bacterial populations is modified by the ability of toxins to sequence-specifically cleave single-stranded RNA upon various stressful conditions. We focused on the situation where such toxins can be activated as a part of the mazEF toxin–antitoxin module in Escherichia coli. 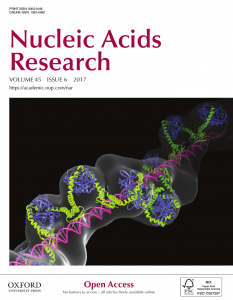 Congratulations to Nela and all co-authors for reporting on this work in Nucleic Acids Research! Congratulations to Junbin of the Bollen lab who just published his research in Molecular Cell. In collaboration with our lab, Junbin showed that there exists a transient phosphorylation signal (BUB1-T461ph) that plays a crucial role in correctly activating the mitotic checkpoint. 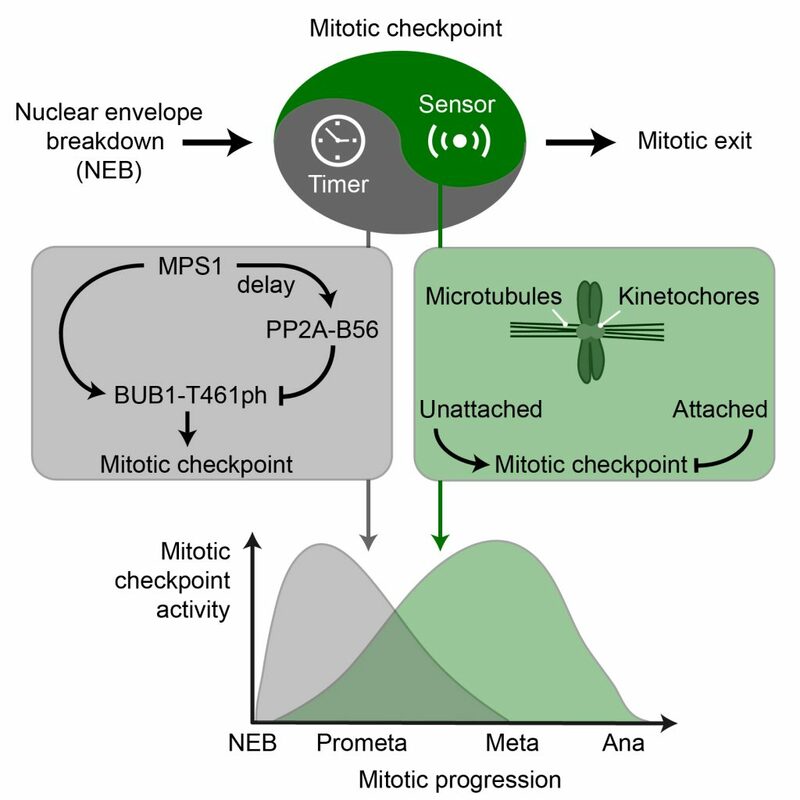 This novel biochemical timer activates the checkpoint independently of the microtubule-kinetochore attachment status, and we show that disrupting this BUB1 timer holds therapeutic potential by targeting cancer cells. The paper was featured on the KU Leuven news. A warm welcome to Nadja D’Uonno and Felix Nolet, who just joined the lab! Their respective PhD projects will focus on experimentally investigating the influence of temperature on cell division timing, and developing theoretical models to describe the spatial regulation of cell cycle processes. 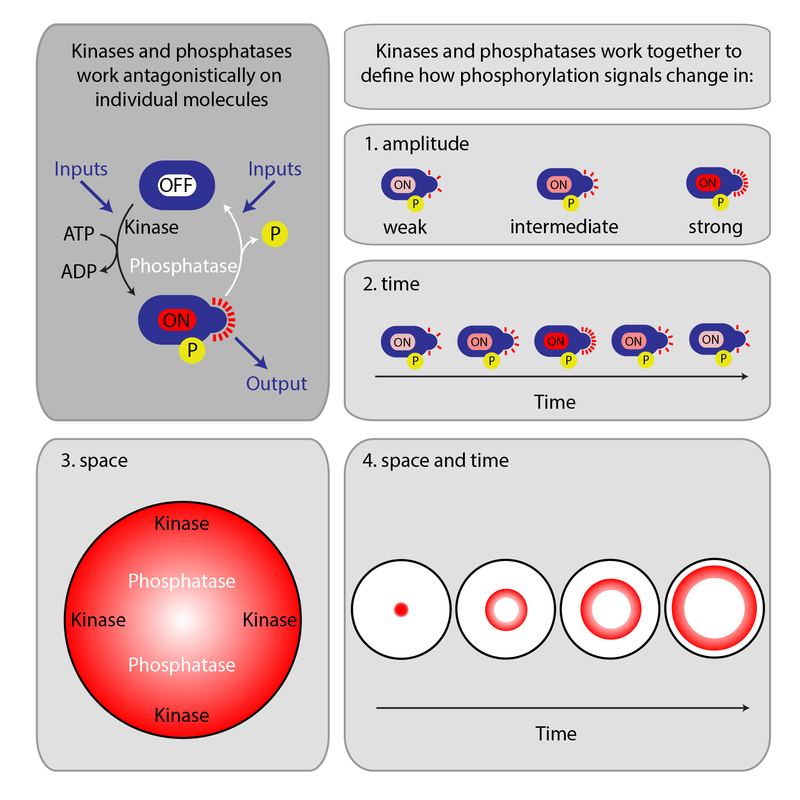 Adrian Saurin (Dundee, UK), Junbin Qian, Mathieu Bollen (LBT lab in our department), and Lendert have written a review article in Trends in Cell Biology on how interacting kinases and phosphatases control mitotic processes in space and time. Alexandra, Jan and Lendert organized a workshop at the Children University event of KU Leuven. 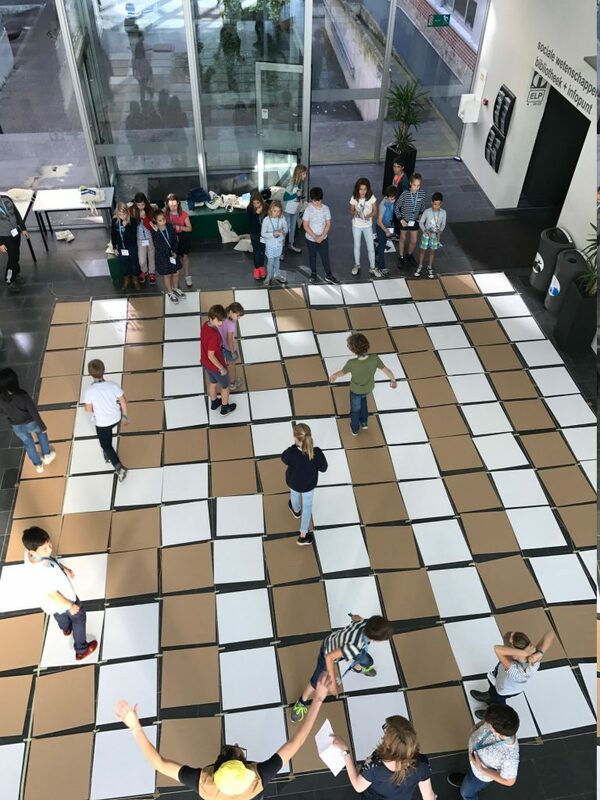 Several groups of children in primary school (8-12 years old) visited the university and they played several games in which they learned how more complex patterns can emerge from simple rules. The picture shows the kids applying one of Wolfram’s cellular automata rules using two-color cardboards. Jan won the best poster award at our local departmental mixer event. Here, PhD students present their work, which aims at increasing interaction between the 14 research labs in our department. Well done Jan and enjoy the goodies that you got! 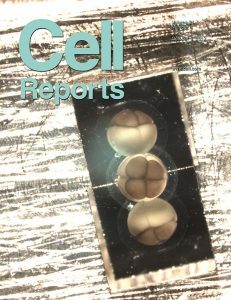 Joint work with Graham Anderson from Jim Ferrell’s lab just got published in Cell Reports and featured on the cover. In this work, we applied strong temperature differences across young frog embryos to desynchronize the regular cell division timing. 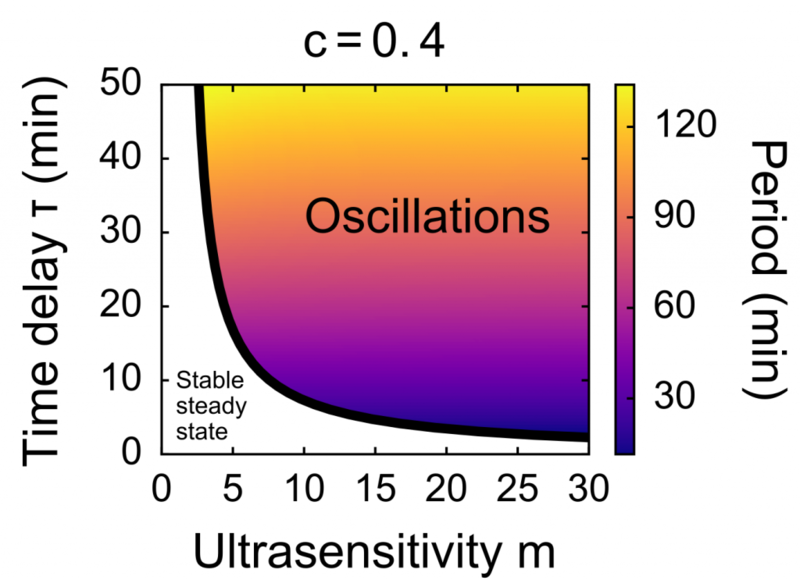 We found that all cells behave as independent oscillators. Moreover, we saw that although mesoderm induction becomes abnormal initially, the embryos are still able to get their development back on track. Jan and Jolan both received a FWO doctoral fellowship to pursue their research these next 4 years, while Alexandra and Pedro received a one-year postdoctoral grant from KU Leuven. Pedro was also awarded a three year grant from the FNRS. So happy for everyone and proud to have such talented researchers in the lab! 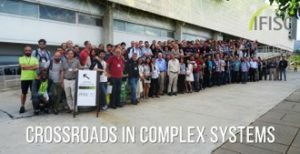 From June 5-8, the IFISC institute (Institute for Cross-Disciplinary Physics and Complex Systems – UIB-CSIC, Spain) celebrated their 10th anniversary by organizing the conference “Crossroads in Complex Systems”. This wonderful meeting ended on a high with Stefan winning the best poster award for his work “Modeling the dynamics of a small community of interacting human colon bacteria”, congratulations Stefan! In the PRA paper, we show that bright and dark solitons can coexist in normal dispersion optical resonators in the presence of third order dispersion. In the EPJD work, which is part of a special issue on the Lugiato-Lefever equation, we study how solitons interact with one another. 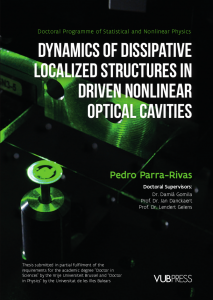 On March 3, Pedro successfully defended his PhD thesis entitled “Dynamics of dissipative localized structures in driven nonlinear optical cavities”. You can find a copy of his thesis here. Excellent work Pedro! Pedro published a paper in Physical Review E as a Rapid Communication, in which he reports on a new mechanism for excitability in extended systems without underlying oscillatory dynamics. Well done Pedro! Alexandra has published two papers based on her PhD work on bacterial toxin-antitoxin CcdB-CcdA systems in the lab of Remy Loris. One paper has been published in JACS, and one in NAR. Additionally, the latter paper has been selected as a breakthrough article, congratulations Alexandra, great stuff! On Dec 14, Julen Gelens La Greca was born. 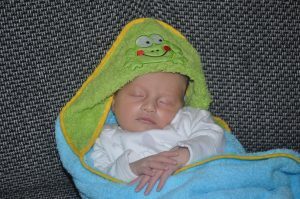 Being by far the youngest and cutest member, he has a courtesy appointment in the lab as mascotte and frog whisperer. Jan has joined the lab and will be studying the coordination of biological processes (i.e. the cell cycle) from a more mathematical point of view. Glad to have you in the group! Our collaboration with the Santos lab at MRC has lead to a first publication in Mol. Cell. 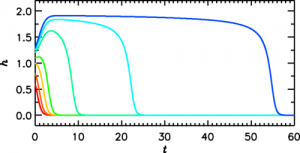 We show that positive feedback is crucial in keeping M phase constant and temporally insulated from other cell cycle events. 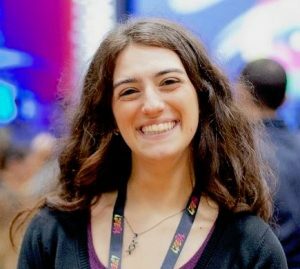 Welcome to the lab Alexandra, congratz on a great PhD thesis and we’re very happy to have you on board to help exploring the regulation of cell cycle processes. Congratulations to Pedro for publishing his work on localized states and optical frequency combs in normal dispersion cavities. See his Optics Letters and Physics Review A paper here and here . Goodbye Ferrell lab, Stanford, and California, you were absolutely great and will be missed! Lendert officially starts the lab “Dynamics in Biological Systems” at the department of Cellular and Molecular Medicine, KU Leuven. He will, however, still stay half a year longer at the Ferrell lab at Stanford University to finish ongoing projects.